What Is Beet Pulp Horse Feed? Triple Crown has always been the leader in beet pulp based horse feeds. Take a moment to read more about beet pulp based horse feeds below! Beet pulp has been a popular feed for horses for years without many people really knowing why. Beet pulp is a byproduct of the sugar beet industry that is predominant in the upper Midwest, Michigan, and California. Sugar beets look a lot like a turnip that has been taking growth hormones, they are very large. The beets are grown and processed not so we have something to feed to our horses, but for the sugar content. After the sugar is processed and removed, the pulp is left over. Recently, the use of shredded beet pulp has become increasingly popular as a feed ingredient; first in the pet food industry followed by the horse feed market. Today, about 90% of the beet pulp produced is sold to the export market in the pelleted form. The shredded beet pulp market is primarily domestic. Up until the last couple of years, shredded beet pulp was only available in bags, but now feed mills using it as an ingredient can buy it in bulk form. Initially, consistency of particle size and stem and root contamination were a concern. Stems and roots look like small pieces of balsa wood that are typically about 1 to 2 inches in length and about a ¼ to ½ inch in diameter. Utilizing improved screening systems the industry is continuing to do a better job of making the product cleaner and more consistent. Beet pulp is often referred to as a “super fiber” due to its high digestibility and ease of fermentation. The reason is the lack of lignin in the fiber. Tall pastures and overly mature hay cannot be digested well by horses because of the high lignin content in the plant to give the stalk strength. In addition, high lignin content fibers like peanut hulls, oat hulls and rice hulls have very low fermentation properties and are, therefore, very low in caloric content. Beet pulp, on the other hand, has about the same caloric content as oats. It is unusual to have a fiber product that is easier on the horse’s digestive system and still provides the calorie content of a grain product. Furthermore, in the shredded form, the beet pulp provides some additional fiber length, often referred to as scratch factor, which is lacking in many alternative fiber sources and explains why shredded beet pulp is preferred over pelleted beet pulp in equine diets. Individuals mixing their own rations need to understand that beet pulp is a very dry product at only about 5% moisture. If a horse consuming beet pulp does not chew long enough or provide enough saliva, the beet pulp could cause choke. This is why most horse owners soak the product in water prior to feeding. One of the advantages of feeding a beet pulp based commercial feed is that the addition of oils and molasses eliminates the need for soaking. Also, beet pulp is lacking in nutrients such as Vitamin A and Selenium. In a diet where a significant amount of beet pulp is fed, balancing nutrients can be a challenge. When used as an ingredient in manufactured feeds, the supplier can properly supplement for these critical nutrients. With the current focus in the horse industry on lowering non-structural carbohydrates in equine diets, it is important to note beet pulp has an average NSC of around 12%. This fact, combined with its good calorie content and ease of fermentation make it an excellent ingredient for formulating high fiber, low carbohydrate diets. 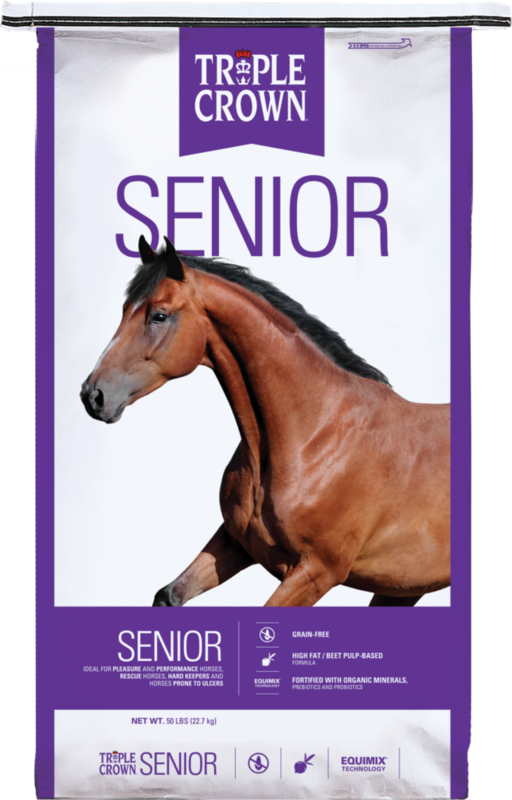 These beet pulp based diets can benefit not only older horses but also horses suffering from gastric ulcers, respiratory issues, metabolic diseases and many other feeding situations. For horses with poor quality fiber sources, beet pulp based feeds can provide a consistent, cost-effective and convenient forage alternative. Triple Crown Feed offers superior nutrition with fixed formulas and our unique, Equimix. To prove it, we invite you to compare your horse feed now.